Jared Unzipped: Why You Should Eat More Watermelon. I recently discovered some very intriguing information about one of Summertime's most popular foods -- the watermelon. Within the red, tasty flesh of the watermelon exists a very special anti-oxidant called lycopene. In clinical studies, lycopene has been shown to be an aggressive cancer-fighting agent. It's also responsible for making watermelon red on the inside. Data gained from the North Carolina Research Campus, which operates under the N.C. State University Plants for Human Health Institute, has shown that lycopene from watermelons is well-adapted for killing cancer cells. The lycopene acts as a free-range scavenger, actively seeking out and destroying any cancer it finds. But wait... that's not the only benefit of eating watermelon regularly. Not only is lycopene a magnificent anti-oxidant, but it's also great at blocking harmful UV rays from the sun. Lycopene combats the UV rays that can give you a sunburn. Many researchers believe the watermelon is a super-food of the future, specifically highlighting the many potential alternative uses for it. Besides being a tasty source of nutrition, it could also be developed for use in sunscreens, make-up and skin moisturizers. 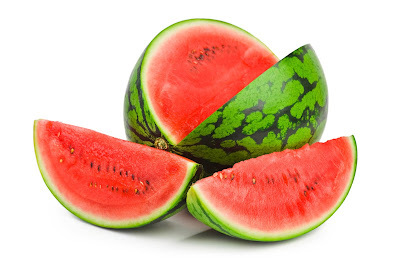 Approximately 92% of a watermelon is water. With every bite you take, you're hydrating your body to the max. In a nation where nearly 75% of all American adults could be classified as dehydrated on a daily basis, increasing our water intake is vital to long-term health. Face it -- the watermelon is your friend! Eat some watermelon, for your own sake.